Canados has two private marinas, with direct access to the sea. 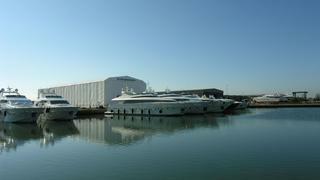 They also provide berths for clients' yachts for winter storage, scheduled maintenance and refits. Canados has announced the delivery of its first yacht since it came under new ownership. 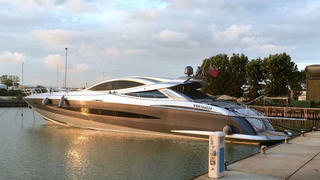 The 27.5 metre Canados 90 Gladiator has been delivered to a client based in Ibiza. French entrepreneur Michel Karsenti acquired the Italian shipyard at the beginning of February and announced a new product range. The iconic Rome-based shipyard also celebrates its 70th anniversary this year. Styled inside and out by Luiz de Basto, the Canados 90 Gladiator is a fast-planing yacht that can accommodate eight guests across four cabins. The new arrival has been finished with a sporty gold hull colouring and has the performance credentials to back this up. Fitted out with twin 2,600hp MTU 16V 2000 M94L engines coupled to Arneson surface drives, the new Canados 90 Gladiator is capable of a top speed in excess of 48 knots. The yard adds that she completed her 520-mile delivery trip from Rome to Ibiza in 13 hours at an average speed of 40 knots. Back in March, Canados revealed its 18 month plan to revamp the yard's infrastructure. Phase one is already underway; the assembly sheds have been upgraded and dredging in the marina basin is to start soon. The yard has opened the first Canados factory office in Golfe Juan, France, as a way of dealing directly with clients and allowing existing owners to benefit from the factory services and assistance when required. Canados also announced a new agreement with Venice-based Cristiano Gatto Design, who will work with the design team on the new projects. Cristiano Gatto said, "Myself and the entire team are really proud, as we know from fact that anything is possible at Canados and every detail will always be produced in the best possible way. We experienced great collaboration with Canados in the past and I know their interiors can only exceed both my team and clients’ expectations." 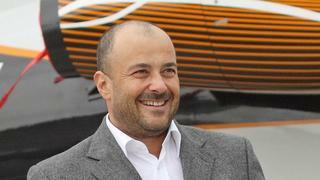 French entrepreneur Karsenti has already built more than 12 yachts at Canados, including a number from his own brand Oceanic Yachts. Canados will now continue to produce the Oceanic Yachts fast expedition yachts, as well as the Canados Yachts range of modern classic models, and the Gladiator Yachts line of sport yachts. “As you can imagine, we did not acquire such an iconic shipyard as the result of a caprice. It’s been a long process and a well thought out move,” explained Karsenti following the acquisition. Karsenti added that he had always been "fascinated" by the shipyard. “Year after year, visit after visit, Canados still has the same magical feeling, where strong maritime traditions are embedded in the DNA of the workers,” said Karsenti. Canados has successfully delivered more than 700 yachts since it was founded in 1946. One of the most notable models is the 36 metre Canados 120, the first of which, Far Away, was launched in 2012. Meanwhile, the first Oceanic 140 explorer yacht is currently under construction at Canados, after the contract was signed in 2014.